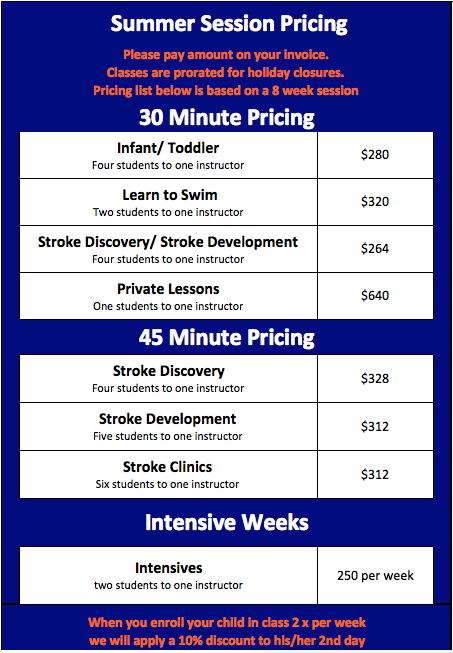 Swim Tank offers a seasonal program during the school year months and a separate summer program. We have 2 locations to choose from, West Harrison and Mamaroneck. Registration takes place 5 times a year during October, January, March, May, and July. New clients are registered in one of two ways. The first way is by getting on our wait list, which automatically happens when you join our email list. Our email program (Constant Contact) records the date and time of when you join it and we use those “join” dates to register clients in priority order. Families on our waiting list get first access to any new openings during enrollment months. The second way to register is by checking to see if “Open Enrollment” is taking place by clicking on your preferred location below. “Open Enrollment” is when we list our remaining openings via our website after our wait list enrollment has been completed. Our seasonal lesson program runs from September – June and we offer 4 sessions. Session #1 runs from September to November, session #2 runs from November to February, session #3 runs from February to April, and session #4 runs from April to June. Each session is between 10 and 12 weeks long. Registration occurs 2 weeks before the start of each session. However, fall registration begins in July. We offer a summer session from the end of June through mid August, typically 8 weeks. 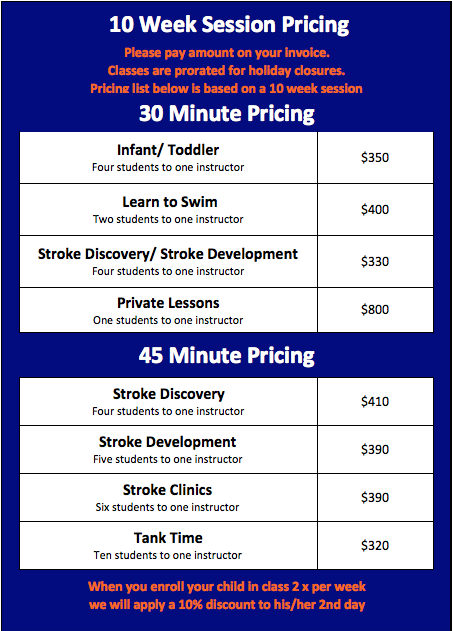 The summer program is a great opportunity to get your child at Swim Tank. The summer schedule offers unique programs with more flexible scheduling, and privatized instruction. Registration occurs in mid- May.